If you require the very best wired headset / USB sound card combo for speech recognition then this is the hardware for you. Microphone Comparison Chart for more details regarding microphone performance. The FlexyMike Dual Ear Cardioid – DEC, is a lightweight (about 25 g./0.9 oz.) 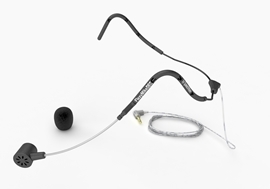 stainless steel headset microphone designed specifically for accurate, noise cancelling and comfortable speech recognition dictation, and other Voice dependent applications. Manufactured in the style of a traditional headband, the frame is covered with injected rubber protectors that covers both ears for maximum working comfort. An extremely flexible gooseneck and cardioid microphone, enables the consistent positioning of the microphone capsule and superior recognition accuracy with Dragon NaturallySpeaking. The cardioid capsule excels in delivering exceptional voice clarity with outstanding background noise rejection, making it especially suitable for mobile users and notebooks or tablets, especially when used with the SpeechMatic USB MultiAdapter for maximum performance. Headband style / wearing style is behind the neck and over both ears. Ultra Lightweight and most comfortable design for extended periods of dictation. 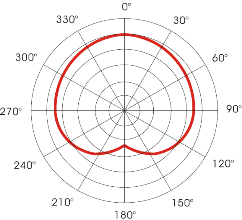 High noise rejection cardiod microphone capsule. Rubber ear protectors / Flexible stay in place microphone boom. Short 1.5 m shielded cable for notebooks, laptops, and tablets. 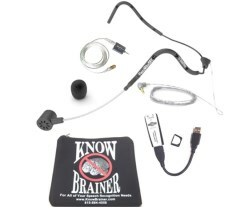 KnowBrainer exclusive shielded Long 2.5 m extension cable for Desktops computers. When you run the NaturallySpeaking Audio Check, you can see the blue bar bouncing up and down even as you do your best to maintain a steady volume level. Simply put, maintaining a steady volume level is not possible. Because of this, NaturallySpeaking measures your highest and lowest volume levels and averages the two scores for a less-than-perfect estimate. The SpeechMatic MultiAdapter auto gain control is similar to the auto volume control found on cassette recorders as far back as the early 70s. It is extremely fast and effective. To give you some idea of how effective it is, when using the MultiAdapter with most headset microphones, you can actually remove the headset, place it on your desktop and continue dictating from about 12 inches away. Your accuracy won’t be quite as high as wearing the headset, but trying that with any other soundcard would likely result in unacceptable accuracy. Because of built-in amplification, the SpeechMatic MultiAdapter auto gain control is ideally suited to soft voices. It can double or even triple the pickup range of short range microphones such as the Sennheiser MD431 II.As you move away from a microphone, the volume level of your voice doesn’t just drop. Your voice also begins to sound thin, or less robust (for lack of a better term). Auto EQ boosts your vocal midrange as you lower your voice or move away from the microphone. In other words, simply amplifying your voice as you speak lower isn’t quite enough. Auto EQ and auto gain control work hand-in-hand. With other soundcards, leaving your microphone on while clearing your throat or setting a drink down on the table can result in unwanted dictation because NaturallySpeaking interprets those sounds as words. NaturallySpeaking 11 introduced a "Nothing But Words” algorithm that works fairly well at differentiating dictation from noise. Unfortunately, it can take up to 4 seconds to process that information. The MultiAdapter de-clicking algorithm works in much the same way, but only takes about 1/10 of a second and can prevent unwanted noise from even reaching NaturallySpeaking. Unlike other USB soundcards, the SpeechMatic MultiAdapter actually changes the characteristics of your voice. If you play back a recording of your voice in the greenlight mode, with all the specialty effects, it will sound a bit thin because the sound of your voice is being altered (tweaked) to increase your NaturallySpeaking accuracy. While this is effective for speech recognition, it is not ideally suited to uses such as VoIP and gaming. For this reason, the MultiAdapter additionally includes a blue light bypass mode. This, as the name implies, bypasses the special effects. Note that for the purposes of speech recognition, most of our tests were performed exclusively in the greenlight mode which is also perfect for end-users with soft voices and can even extend the pickup distance on short range microphones like the Sennheiser MD431 II. The SpeechMatic MultiAdapter is significantly higher priced than other USB soundcards because it is unlike any other USB soundcard and not just a USB soundcard. You might not be able to justify the expense for consumer use but if speech recognition plays a significant role in your workflow and you’re not already using a SpeechWare TableMike or TravelMike (which includes this technology), this is a must-have soundcard. While each end-user will experience different results, our tests, showed accuracy improved by a full 1% over other USB soundcards. That may not sound like much, but it’s the difference between 97% and 98% accuracy (a noticeable improvement). These results actually meant more than 25% fewer errors for our testers!